Hello everyone. If you haven't heard we are having a Christmas Party over at A Blog Named Hero all month long. The theme you ask? That's right. Santa decided we were very good girls this year and brought us our wish lists early so that we could share them with you. It's a phenomenal month with many, many talented guest designers and sponsored by some of the BEST companies in the industry. It's sure to have items that will top your wish lists. Today I am sharing some Hero Arts goodness. On the top of my Wish List from Santa was A New England Winter (I am a New Englander), those gorgeous snowflakes and the Christmas sentiments. Santa delivered!!!! It was a very simple card to make. I started by stamping the snowflakes in Versamark and covering them in Zing embossing powder in Silver. THIS should be at the top of everyone's list. The silver glitter embossing powder is AMAZING. The sparkle and shine it adds is incredible!!! I also stamped the title the same way. I had to use black paper just to show you how incredible it looks. It looks really good on white paper too. 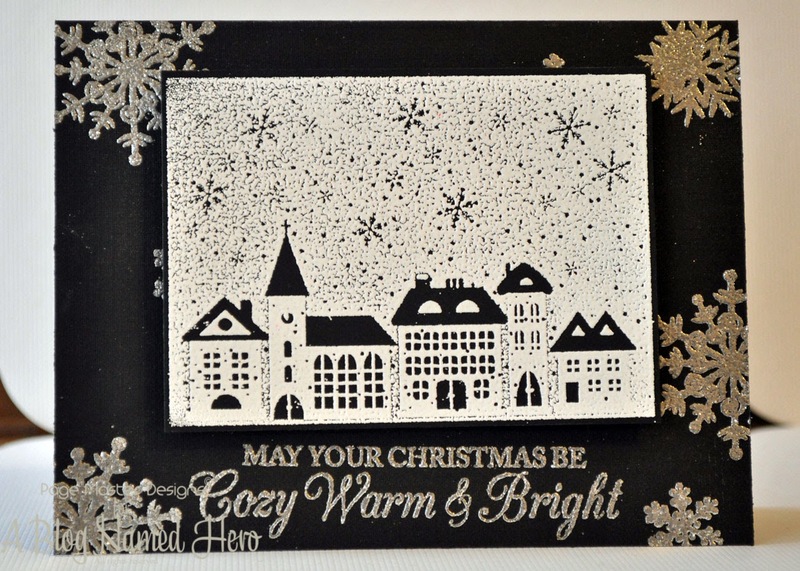 I stamped the New England Winter stamp in versamark and heat embossed in white. I pop dotted the scene to give it a little dimension. This was so simple to make. 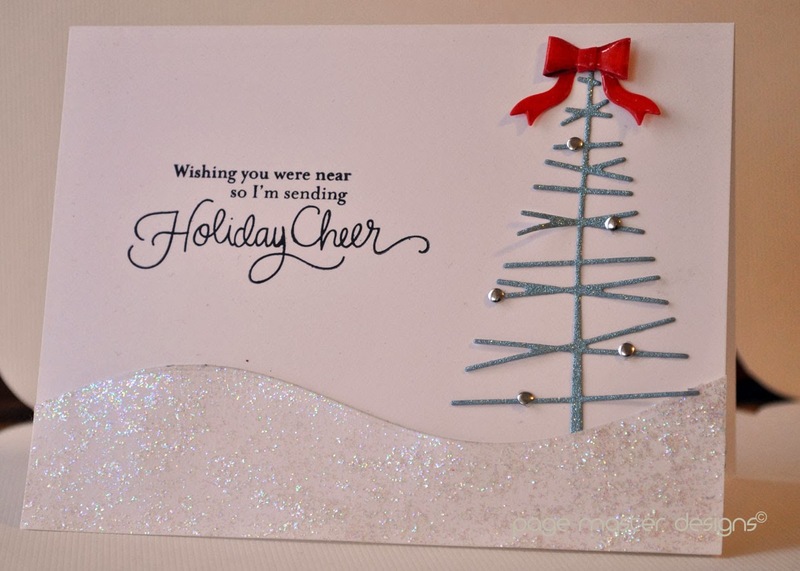 I die cut the tree out of DCWV glitter paper. If you have not seen this stuff in person you have no idea what you are missing. Never in a million years would I have even picked this stack up. The photo on the cover doesn't do this paper justice by any means. It makes you think that it is hard, very textured, chunky glitter paper and the truth is it's soft, thin and absolutely STUNNING paper. I saw it in person for the first time at a stamp retreat, that I recently went to with a bunch of friends. One of the girls had this sitting on her desk and within minutes this was on the TOP of everyone's' wish list. In fact, we pretty much bought Archiver's out of all their glitter stacks that day. It's incredible paper. I have linked you to the 6x6 stacks below. TRY IT! You will not regret it. The colors, texture and thin feeling of this paper is AMAZING and it cuts like a hot knife going through butter in the Silhouette. :) I will have more on this paper soon. Now please head over to A Blog Named Hero to see what the other girls have done. Be prepared to list the amazing supplies and add them to your Santa wish list.